I am extremely excited about the technology of today. You can do just about anything you set your mind to. I have just released one of my books as an iPhone app due to the fact that I am a box away from being sold out of the actual books. 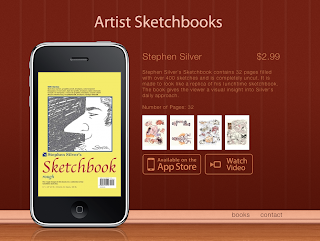 Stephen Silver's sketchbook which I made to look like a real sketchbook will not be reprinted and is now available as an app and real cheap too. only $2.99. You can order it and many more artist sketchbooks through this site artistsketchbooks.com or you can download it straight from your iPhone in the app store, simply type in Stephen Silver. 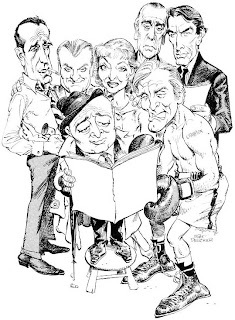 Mort Drucker, world famous caricaturist and humorous illustrator best known for his work in MAD magazine has made an exclusive, never before seen tutorial film about his process and life experiences. Presented and interviewed by Stephen Silver. To watch the 2 hour and 15 minute film go to www.schoolism.com and click on "The Masters Series" banner located on the bottom. The film will debut starting January 2oth 2010.